Catmoji The Pinterest of Cats: A new social network Catmoji appears on the network, but this time it is directed at people of flesh and blood, but their pets. 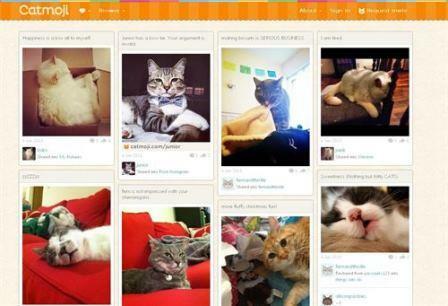 Catmoji is a social network Pinterest about cats. The owners of these animals can create a profile to their cats and not just post their photos but also choose an avatar for your profile picture and comment as if it were a person. Social networking has caused genuine rage among Internet users. Every day thousands of new accounts opened in Facebook, Twitter, Pinterest or Tumblr to contact friends or family and stay abreast of the latest news of the day. Everything is shared on social networks. But the craze for social networking has gone from humans to animals. After spending hours at the computer actualization profiles, talking on the chat with other contacts or writing a post, what better way to give off a Facebook profile to the dog or cat. While Facebook and Twitter are among its users with profiles of cats and dogs, for example, the dog’s own Mark Zuckerberg, a new social network arrives exclusively for cats. Catmoji is a social network dedicated to cats who joins Doggy Talky, for dog lovers. This social network started out officially on 24 December and on a single platform offers two of the most important trends on the Internet in recent years: cats and photos in social media. Catmoji Pinterest bears some similarity in terms of image. Yes, all the photos posted are of cats. Users can also accompany your pictures and comments through a series of emojis attached to them, and a set of badges that users have to unlock the Foursquare style, but always with reasons ‘feline’. To be part of this network is necessary to receive the invitation. Join Catmoji.